After a morning of running subjects, I was excited to take the train out to spend the weekend in a brand new country! From Nijmegen, it was about 3 hours to get into Brussels, so I still had a bit of late afternoon light to explore the city. I grabbed myself a locker at the train station for my overnight bag, which I am liking more and more as a way to minimize overnight stays and maximize time spent touring new places. Not going to lie, the Brussels train station did smell a little like waffles when I went upstairs, which I took to be a good start. It had started to lightly rain, but I was undeterred! 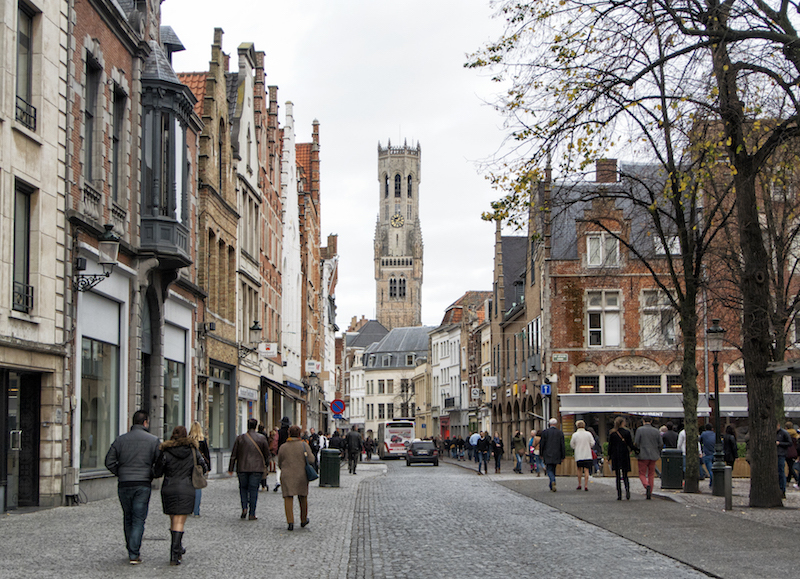 I took a meandering route, past St. Michael’s Cathedral, through the Galeries des Hubert (one of the oldest shopping arcades in Europe) and out into the Grand Place. 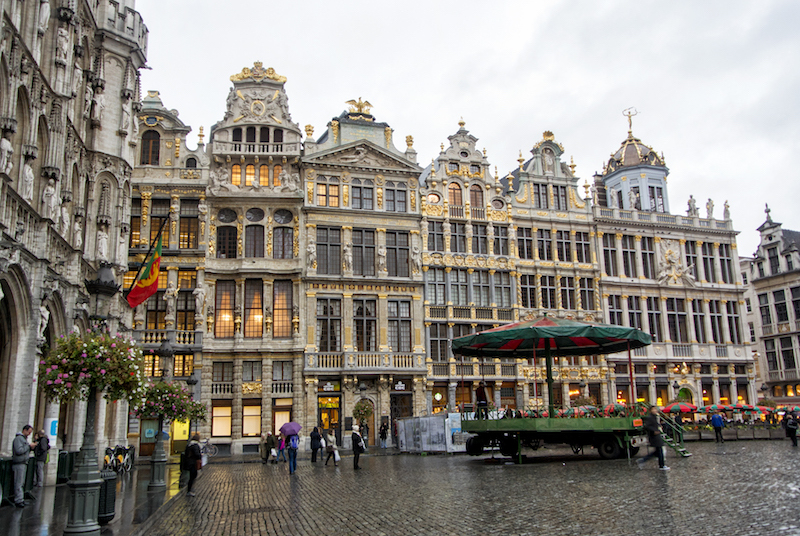 The Grand Place, which has roots dating back to the late 11th century, was a truly awe-inspiring site, and it was hard (even in the soggy rain) to not marvel at its splendor and ornateness. I wandered my way through the winding, darkening streets and came across a hip little café (Café Capitale), where I enjoyed a delicious cup of hot chocolate and their wifi. 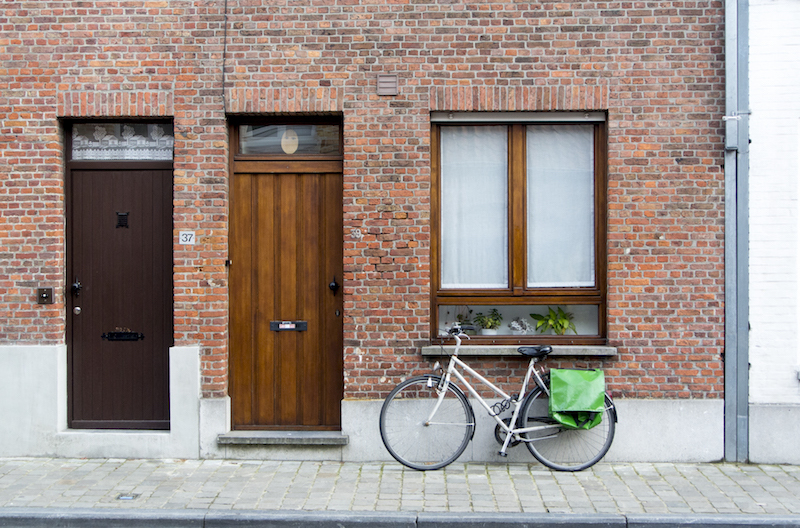 I had planned to stay one night with my friend Paul, who lives in Brussels, so I hopped on a packed bus out to Ixelles to find his place. It’s a fantastic two-level apartment, with a large spacious kitchen and soaring ceilings. It was great to catch up (we’d met up 7 years ago in Chiang Mai), meet his wife and play with his adorable dog Puddles before heading out to grab dinner at a local burger spot, Burger Republic, that they’d been wanting to try. The fries and mayonnaise were, unsurprisingly delicious, and the burger was one of the better ones I’d had–juicy and flavourful. The next morning, we visited the local weekend market, where Paul picked up some cheese and tasty goodies. I love walking through markets, even if I don’t buy anything, if only to admire all the delicious possibilities. As his sister-in-law was coming into town for a visit, I said my goodbyes for the day (as I’d be meeting them later for dinner) and headed out to explore the city in the daylight. I’d spotted some impressive looking buildings on my bus ride the night before, so I made sure to hop off the bus to check them out. 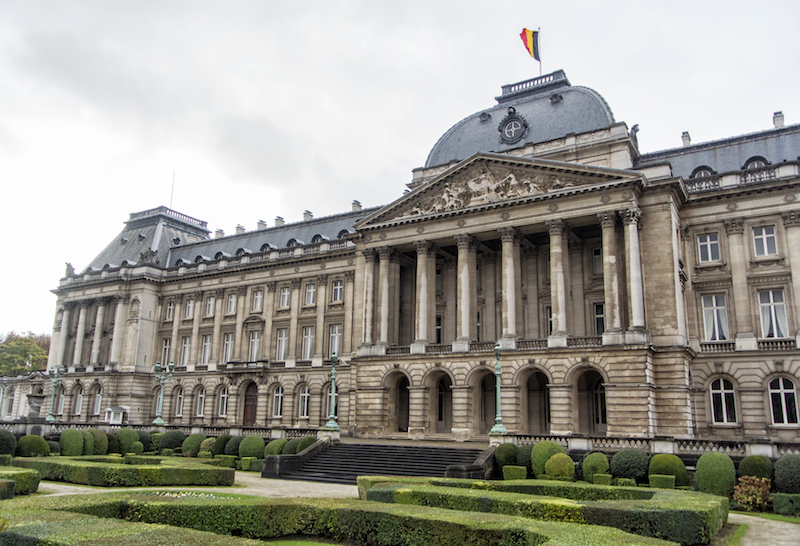 Turns out it was the impressively grand Royal Palace of Brussels that had caught my eye–reminded me a lot of the architecture in Paris. 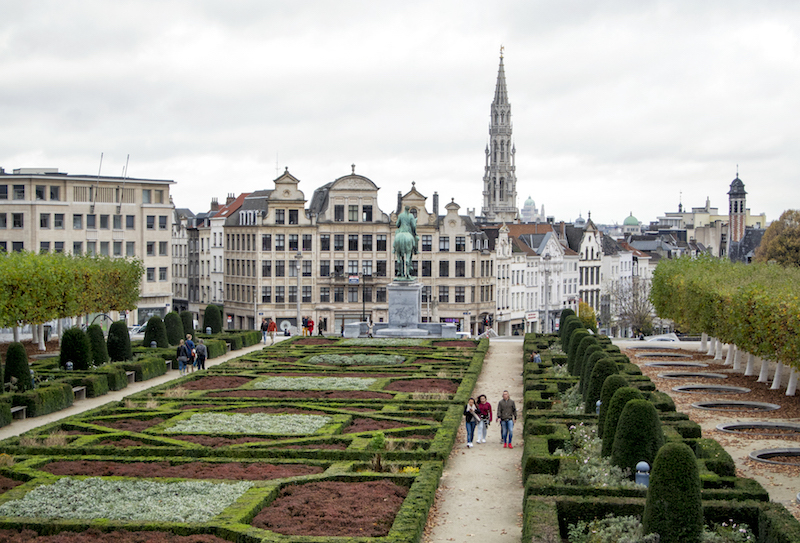 I wandered down, past the beautiful, art-nouveau Museum of Musical Instruments and through the Mont des Arts, which afforded a nice view of Brussels, even glimpsing the massive Basilica of the Sacred Heart in the distance. From there, I made my way back to the Grand Place (I probably ended up going through it 6 or 7 times during my stay, as it made for a good point to orient oneself) and found my breakfast spot: Maison Dandoy. One cannot visit Belgium without, at least once, sampling their renowned waffles. I actually opted to try a liège waffle, with strawberries and ice cream (naturally). This type of waffle, while not the closest to the classic North American “Belgian” waffle, is a popular choice in Belgium. They are sweeter, denser and richer, which results in a surprisingly filling little waffle. Being a Saturday, the streets were bustling with folk, predominantly tourists. 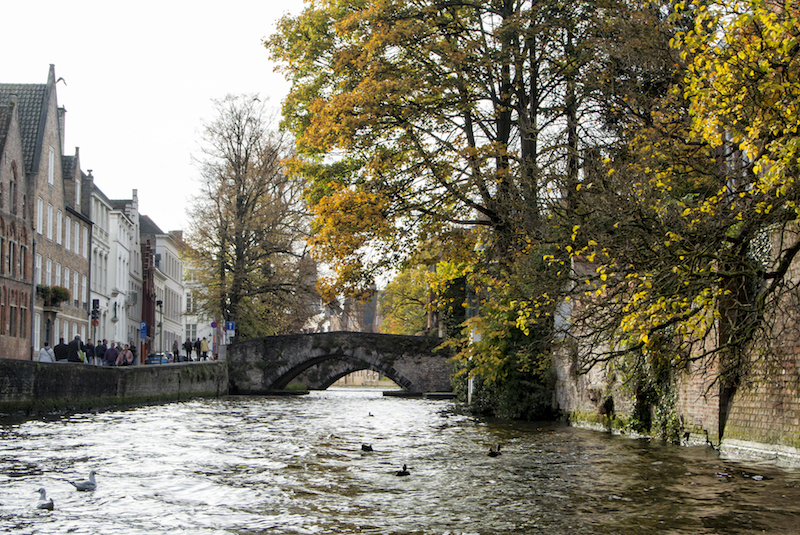 I was a bit surprised, given that it was November, that there’d still be so many tourists in town. 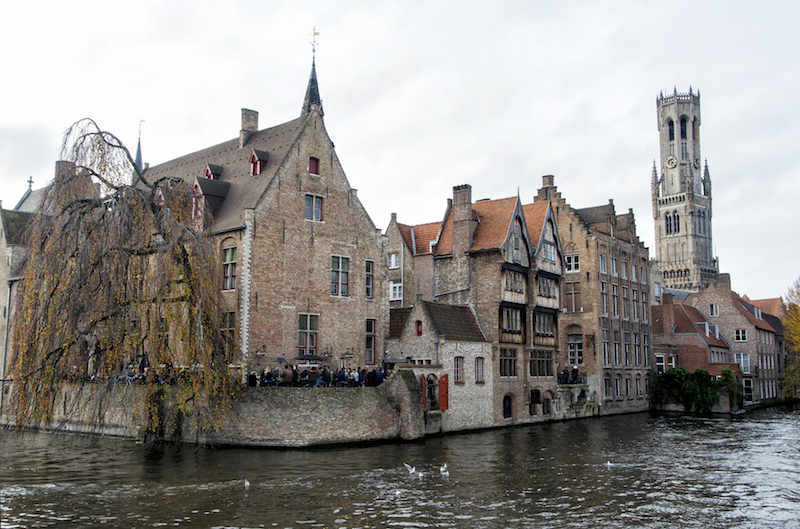 I made sure to pay homage to Manneken Pis, the famed bronze statue of the little boy peeing into the fountain, purportedly an emblem of the city’s somewhat irreverent and rebellious spirit. 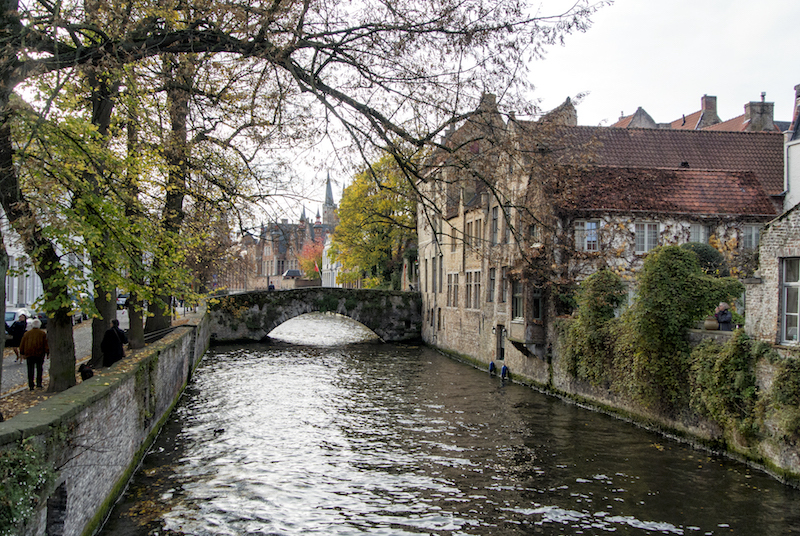 It had started to clear up and was turning into a beautiful day, making for a pleasant walk through the cobblestone streets. 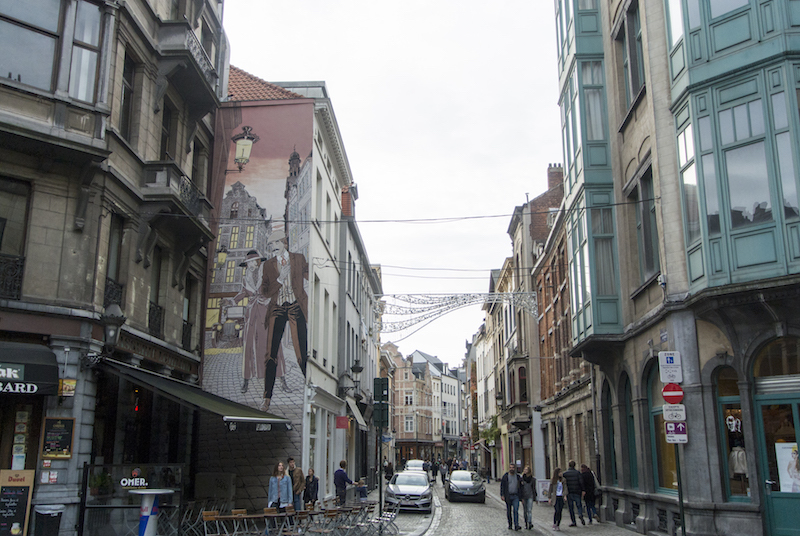 Brussels is renowned for its street art, with murals and smaller works dotting buildings throughout the city, from Tintin and Christopher Walken to a hip hop version of Manneken Pis (I barely scratched the surface with what I saw). I made a quick stop again for wifi and pie at Café Capitale, before heading in the general direction of the AirBnB I’d be staying at. On my way, I did go back to the Museum of Musical Instruments, however, as I’d heard that the view from the café on the top floor was superb. It was bustling with folk, but I managed to snag a seat near the windows. Unfortunately, the rooftop deck wasn’t open, so I had to content myself with my window-side table (still a nice view), where I had a glass of wine before heading back out. I stopped in to see St. Michael’s Cathedral, a beautiful Gothic church dating back to the 11th century. I do love visiting churches, not only to appreciate their often soaring grandeur but also to enjoy a quiet respite from all the bustle and pavement-pounding of the day. 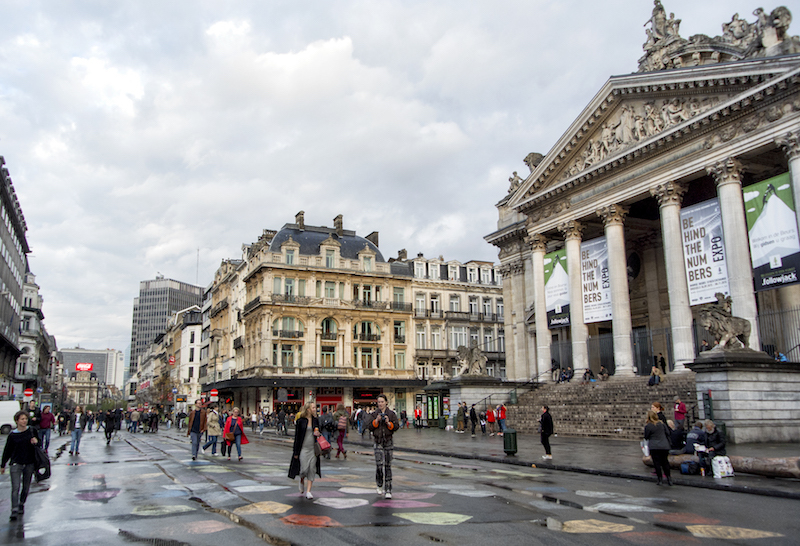 I headed up past the Grand Place and across Bourse, a broad, pedestrianized street and home to the Brussels Stock Exchange, lined with restaurants and fast food fare. I found the AirBnB apartment and acquired my keys, chatting briefly with the host, before heading back out. I walked down Bourse to find the metro and was soon whisked off to another area of the city. 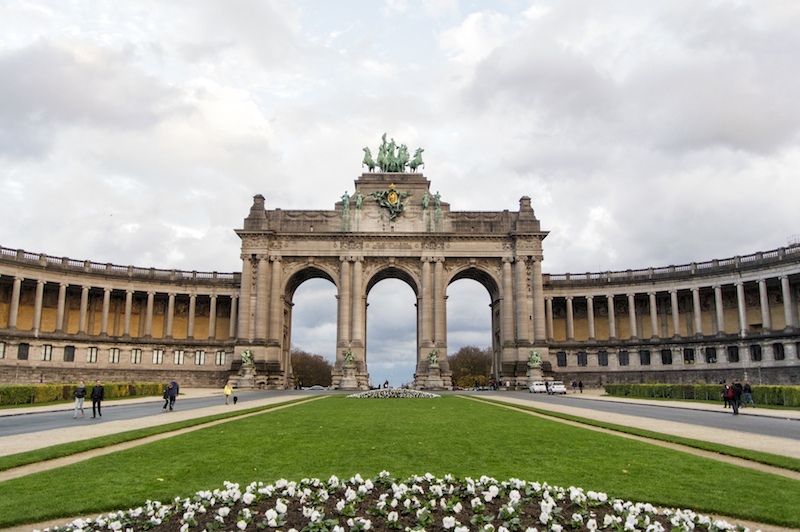 I wanted to visit Cinquantenaire Park with its impressive Arcades du Cinquantenaires. The light was already beginning to fade as I walked over, but it did not diminish the scale and impressiveness of the triumphal arches. I walked through the quiet park and back to the metro, deciding that I’d head over to Paul’s apartment a bit early to meet them for dinner. After 7 hours of standing and walking around, my legs were starting to object. It was quite the dinner party we ended up having, with 9 people (friends and relatives of Paul and Emily’s). 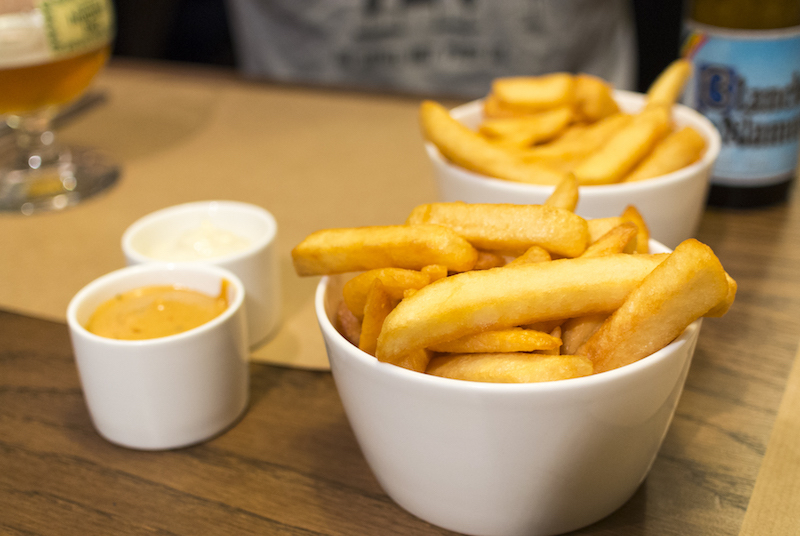 We made our way over to a place known for their moules frites, a classic Belgian dish. Volle Gas was a bustling spot in Ixelles–so busy we ended up being taken upstairs to their second floor dining room (empty when we arrived but soon after filled up as well). I ordered garlic and cream moules frites, which was absolutely delicious. The mussels were fresh and flavourful but not overly fishy tasting, and they were not kidding around with the garlic or the portions, for that matter. I laboured ardently to make my way through my sizable pot of mussels. Stuffed to the brim, we waddled our way through what looked to be a lively area with bars and restaurants. We snagged ourselves some outdoor tables and settled in for a drink, enjoying the fact that we could still sit outside despite being November!